Gotta get one bugaboo about Babe Ruth out of the way right now. After reading an adult history of the Bambino, it’s hard to imagine the real George Herman Ruth coming home at all. The Captain of the Cathouses, the Pasha of Putytang, the Amir of Alcohol, the Sultan of Swat, Sweat & Suds……cast in a sanitized role ? That is like casting Jose Canseco as Ashley Wilkes in Gone with the Wind. See the Southern Gentleman with boa constrictor, recreational drugs on the night table, with mirrors over the bed in his Plantation House. If you don’t understand, please read Leigh Montville’s The Big Bam and Jessica Canseco’s Juicy as soon as possible. OK, then. Babe as the Country Innocent stopped me in my tracks. Just sayin’. This movie depicts Babe’s rise from small town loser to major league slugger. The youngster has few social skills. But his golden heart is devoted to his family, pets and overall good behavior. Now, this isn’t a narrative about the Bambino. It’s entirely fictitious. The Yankees are never mentioned, nor the Sox, nor Baltimore, nor Brother Mathias nor anything else relating to the real Babe. It’s just Babe playing a Bumpkin who happens to be named Babe, who happens to hit baseballs so far he ends up playing in the Polo Grounds. SABR folk and baseball historians will feel rewarded with a screening of Headin’ Home. Babe was 25 when this flick was released. He looks every bit of the 6’ 2” 215 pound he is listed at on baseball-reference.com. This was the year that Ruth registered a .376 B.A., 54 HR and 137 RBI. He walked 150 times. He scored 158 runs. He registered a 1.379 OPS, the highest of his career. And he did it all in 142 games. He is tall, broad shouldered, slim waisted and barrel chested. The shots of the Polo Grounds are brief but inspiring. Deadball era dudes with straw skimmers fill the ornate boxes that front the upper deck. The crowd is wild. The long gone skyline of Coogan’s Bluff looms. The teams walk to the clubhouse in Centerfield after Babe’s dinger, verifying they are where you thought they were. Clubhouses in Center. The plot is maple syrup. Babe lives with Maw and Pigtails and their pup in Haverlock. Si Tobin, local tycoon, has a wayward son and a beautiful daughter that Babe would like to court if he only could find the words. A huckster comes to town and weasels his way onto the Haverlock baseball team and into the heart of Si’s beautiful daughter. The huckster blocks Babe from a roster spot on the Haverlock 9. Ruth suits up for the opposing team, smacks a home run that travels 7 blocks, and is signed to a big league contract. But before he reports to the MLB, Ruth breaks the Huckster’s spell over Si’s daughter and returns the wayward son to his home. Next, we jump cut to the Babe smashing a walk-off grand slam in the Polo Grounds. He has made good as a Big Leaguer. And he has saved the family pooch from the dog catcher in the process. The Piano work is masterful. The film is remarkably intact. By the end of this hokey film the question is just how big a celebrity was the Babe that this film was produced even before he transformed the Big Apple into a perennial Champion? The answer: He was already huge. On Jan. 6, the sale of Ruth was reported in the papers, which detailed that Babe had declined a 3-year, $10,000 per year contract with the Sox, insisting on twice that much. By mid-July, he surpassed his MLB record of 29 HR’s in a season and the idea of Ruth hitting 50 HR’s was electrifying. The Aug. 15, 1920 edition of The Hartford Courant asked, “Will Babe Ruth’s Home Run Record Compare With Those of Old-Time Diamond Stars?”. The film debuted on Sept. 19, 1920 — 10 days before the 1920 season ended. Thus, the movie was shot during Ruth’s record breaking season. That’s how big the Babe was. Beatles big. John-Paul-George-And-Ringo Big. He will never again wear the scrubbed down halo of the chaste hero, but there is no denying he was a top pop icon by the time he left Boston. So the film attests. 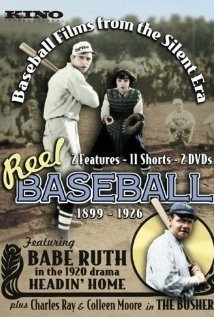 REEL BASEBALL: 1899 to 1926. Featuring Headin’ Home starring Babe Ruth. Available for under $15.00 all over the internet. This entry was posted on September 13, 2011 at 9:07 pm	and is filed under Uncategorized. You can follow any responses to this entry through the RSS 2.0 feed. You can leave a response, or trackback from your own site.